How can Suction Lead to Disharmony Destruction? Acupuncture and Cupping Therapy is an incredibly effective treatment that is thousands of years old. If you have been suffering from Back Pain, Sciatica, muscular pain and spasms, or perhaps cosmetic complaints such as cellulite, then Acupuncture and Cupping Therapy may be answer you are looking for. 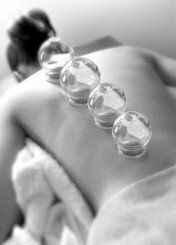 Cupping therapy has been used for centuries across the different continents for healing. And in the Meridian Acupuncture Clinic I have brought this ancient and effective treatment into the 21st century by modernizing its use for present day Western clients and their conditions. What is Acupuncture and Cupping Therapy exactly? Well Acupuncture has been explained in detail in my other articles and book which you can read here The Secrets to an Energetic and Abundant Life so all that’s left is to explaining the cupping aspect of this therapy. Cupping involves using warm suction glass jars on an oiled body as a therapeutic massage system and is designed to treat a wide range of physical problems from pain and muscle spasms to cellulite, colds and flu. Aromatic Oil is applied to the body with deep even massage strokes to loosen up the skin and muscle tissue; the cups are then applied over the oil on to the parts of the body to be treated. Then the cups are moved in particular ways to produce a deeply healing, stimulating and drawing massage. The cups are warmed and applied to the body, thereby creating a vacuum. The suction and warmth has a dramatic effect on the immune system of the body by moving blood and lymph and stimulating the muscle and spinal nerves. The cups are generally applied to the back, shoulders, legs and stomach for a variety of conditions. The cups are usually left in place for a period of several minutes, and this is determined by the condition being treated and style of cupping being used. With Acupuncture and Cupping Therapy there are a number of ways you can treat a patient, from a very quick and rapid placement and removal of the cups called Flash Cupping, to a technique called “Sliding Cupping” where the cups are moved around over a large area – such as your back – to help increase circulation in the tissues. This is an extremely popular treatment with celebrities such as Kate Winslet, Richard Gere, Gwyneth Paltrow, Kate Moss, Madonna and Sandra Bulloch regularly enjoying the benefits. What are the Effects of Acupuncture and Cupping Treatment? The effects of Acupuncture and Cupping Therapy on the body are numerous. The low pressure pull on the muscles and skin result in an increase of blood circulation, a rise in skin temperature, promotion of the metabolism and cell function in the skin, improved function of the sweat and sebaceous glands, and the removal of stagnant dead blood (think bruising). It also activates the secretion of synovial fluid helping to lubricate and ease stiffness in the joints. It should be noted that cupping therapy can also increase and help with peristaltic movements and increases in digestive fluids, thus it can be very useful in treating and dealing with digestive complaints. Used on the back it assists in correcting subluxations and fixations of the vertebrae and plays an excellent role in relieving pain and discomfort of the spine while improving the functions of the internal organs, parasympathetic and sympathetic nerves. From a TCM point of view cupping moves Qi and Blood, resolves stagnation and can be sued to both tonify (strengthen) or drain (reduce) the function of an organ and assist in improving flow of Qi and Blood by resolving blockages in the channels and meridians. If you are suffering from muscular pain, sciatica, back pain, excess cellulite, a cold or flu, I strongly encourage you to consider Acupuncture and Cupping Therapy to relieve any pain and discomfort and to release any blockages in your body. If you have any questions or concerns regarding Acupuncture and Cupping Therapy or wish to start a course of treatment then please feel free to contact me or make an appointment where we can discuss any specific concerns or questions you may have. You have been reading about Acupuncture and Cupping Therapy. It may interest you to read about Acupuncture and Moxibustion Here.